What is the Process for Baptizing a Child or Adult? First-Plymouth typically conducts Baptisms during or after the 5:30 p.m. worship service on Saturdays in the Chapel or during the 9:00 a.m.,10:30 a.m. or 11:59 a.m. . Sunday worship service in the Nave. Of course, special separate baptisms can be scheduled. Once you have a date or two in mind, call Lana, 476-7565 ext. 201 to confirm the availability of the date you want. At that time, you will be asked for information such as name, city of birth, birth date, etc, for the individual being baptized. Approximately 10 days prior to the baptism, the minister will send a letter with the date and time of the baptism, and a minister will call you to set a time for a brief meeting. At baptism the church joyfully acknowledges that God has claimed this person to be one of Christ’s people. As God’s gift, baptism bestows the blessing of the Holy Spirit, through the symbol of water, upon those being baptized. In baptism we pray that the one being baptized will be filled with the Spirit of God and will know of the renewal of spirit, the power of forgiveness, and the abundance of life as God’s child. Baptism with water and the Holy Spirit is the sign and seal of God’s grace and forgiveness. Baptism signifies the joy of knowing that God loves this person. The act of baptism marks the beginning of new life of discipleship with Christ. 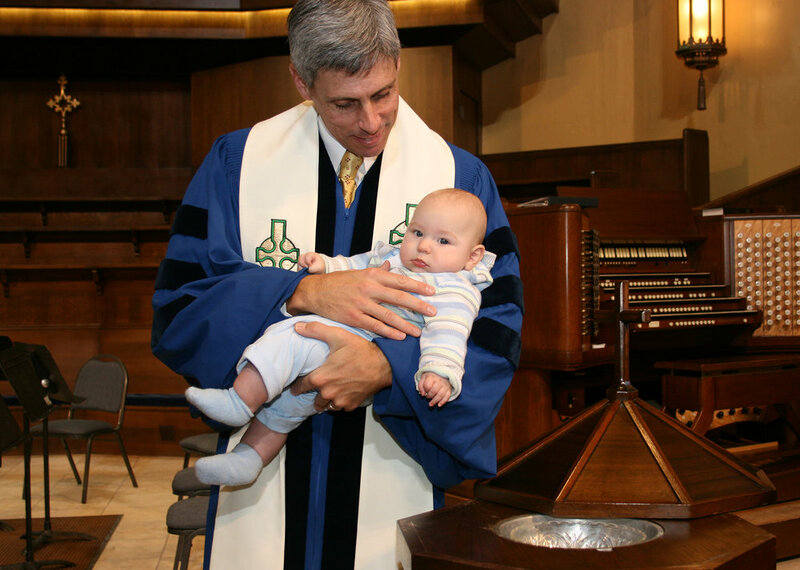 For infants and children, baptism is the sign that they are taken into the care of the Christian church. We do not baptize people to make them children of God or get them into heaven. We baptize people to recognize they are already God’s children. God works through ordinary experiences, events and substances. As water is an essential element in our lives, it is an essential element of baptism. Water is a prominent symbol of cleansing and life in the Bible – the water of creation, the great flood, the liberation of Israel through the sea, the baptism of Jesus in the Jordan River, the living water offered to the woman at the well, and Jesus’ washing of the feet of the disciples. In baptism we are cleansed and purified by the water for a new life in Christ. In the United Church of Christ, some congregations use sprinkling, some pouring, and some immersion. At First-Plymouth we sprinkle a small amount of water on the head of the person being baptized. Who is Baptized at First-Plymouth? Infants, children, youth and adults. Because it is God who acts in calling the person to be baptized, rather than something we do, baptism is not determined by age or experience. When infants and children are baptized, their parents and/or sponsors (godparents) make promises later “confirmed” by the children. This affirmation of the baptismal vows, usually around age 13 or 14, marks the beginning of the confirmand’s adult Christian faith and life. Baptism may take place whenever the community is gathered for worship. In the early Christian church, the season of Lent was used as the final period for the preparation of baptismal candidates. In the scriptures that are read during the seasons from Advent up to Easter, there are many texts that teach the faith and point toward baptism. Candidates were baptized together at the Vigil of Easter (the predawn Easter service) to symbolize their own death to their old life and their resurrection to their new life in Christ. While not required, parents may choose sponsors or godparents for infants and young children who are to be baptized. Historically godparents were to make sure the child was raised in the Christian faith in the event of the death of the parents. Sometimes they actually became adoptive parents. Other candidates for baptism may also have sponsors. At the time of the Baptism the sponsors may accompany the candidates and present them for baptism, and may make promises similar to the promises parents make to help the person grow in faith and discipleship. When baptized in a service of worship, the congregation promises to act as additional sponsors to uphold the parents and sponsors in fulfillment of their vows and to provide for all children full opportunities for Christian growth and nurture. Baptism is predominantly a celebration of the local church family and a recognition of its commitment, as well as a time for celebration by the persons baptized and their families. For this reason, whenever possible, baptism is celebrated when the community has gathered for worship. If circumstances require baptism to take place outside of corporate worship, members of the local church may participate in the ceremony with the pastor to represent the congregation which, in baptism, accepts the person into the care of Christ’s church. In urgent circumstances, such as imminent death, any Christian may perform the baptism.